We thoroughly enjoyed celebrating our 4th Birthday with everyone on Th ursday 28th July. 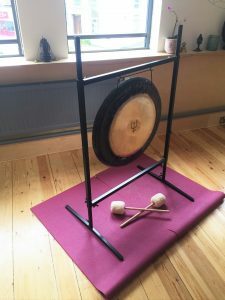 It was wonderful to welcome Kuli’s old and new to the studio for an extra special class free with a fabulous Gong Bath hosted by Angela and Rosin. Our programme of free mini massages and reflexology with Harriet in the afternoon were a huge success and were completely fully booked. We enjoyed lots of tea and cake and company with everyone who came to the studio. We hope you enjoyed the afternoon as much as we did. Looking back over our 4 years in the beautiful Chapel Allerton, we are honoured and privileged to continue providing a high level of yoga classes, one to ones, workshops, retreats and therapies each day of the week. We would not be here today if it wasn’t for our dedicated Kuli’s and new Kuli’s that walk through our doors each day. So we just wanted to take a moment to say a big thank you to all of you for your continued support and look forward to the next four years of Yoga Kula. “I c annot believe Yoga Kula is 4! 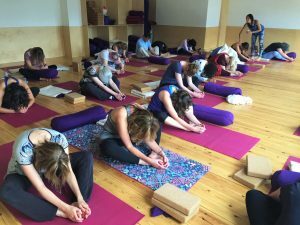 It seems only a heart beat since I stepped off the plane from India over 5 years ago bursting with yoga inspiration and a big dream of opening a yoga studio, where everyone would feel welcome and at home. Each day I took a to small step towards my dream until things began to manifest. I am so proud of Yoga Kula, our team and our students. I sincerely hope we are doing good in the community, creating a positive ripple effect and providing a tonic for modern life – if we are my dream has come true”.